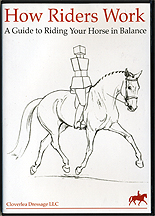 "How Riders Work" is a 50-minute DVD demonstrating how you can become a beautiful, balanced rider. Whether you ride dressage horses, hunters, jumpers or pleasure horses, learn how you can help your horse by using positive tension, power lines and aids that shape and balance your horse. "How Riders Work" represents Part I of the book, How Two Spines Meet, which will be released later this year. Beth is a USDF Certified Instructor through Fourth Level and an â€œLâ€� graduate (with distinction) of the USDF judging program. Beth was the initial editor for Dressage Today magazine and served as their technical editor for more than fifteen years. In that capacity, she was in constant contact with the best dressage riders in the world as they wrote about the technical aspects of dressage. Beth is the author of How Two Spines Meet, which explores the partnership between horse and rider. The book will be released in 2014. Cloverlea has produced a 50-minute DVD representing Part I of the book. The DVD is entitled How Riders Work. Click on the link at right to see the trailer or order the DVD. Beth has administered The Dressage Foundation's Young Rider International Dream Program since 2000. She currently serves as Vice President of The Dressage Foundation.